Want to learn more about watching a Korean drama online? The Korean drama Full House is one of the more well-known dramas. It featured the singer/actor "Rain" (Bi) as the male lead character. 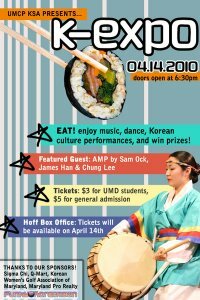 The University of Maryland in College Park's Korean Student Association will be holding their annual K-Expo show on April 14, 2010. 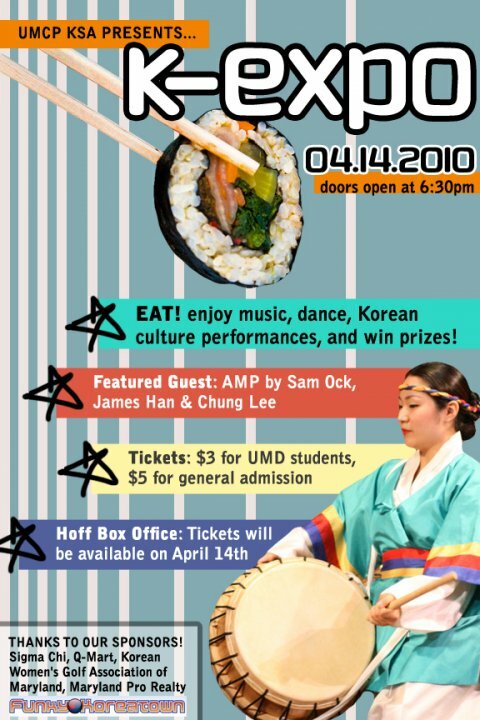 The event showcases Korean culture, and is the organization's largest event of the year, and is open to the general public. The location is the Stamp Student Union. According to the Facebook event page: "Korean food will be provided for dinner with several performances, among which will be cultural performances of Korean martial arts and percussion. We will also exhibit a modern talent showcase where you fellow student artists will perform their amazing talents!" Happy New Year! Happy Valentine's Day! The lunar new year started today, and there were celebrations world-wide. It also happens to be Valentine's Day, but this is a rare "once-in-a-lifetime" type of occurance. The Ehwa Women's Orchestra is performing in the United States this month (May 2009). The video below has excerpts of their concert at the Kennedy Center on May 1. Until the food pages get updated, this blog post presents Cathlyn's Korean Kitchen lesson on how to make Kim Bap. Kim bap looks like a sushi roll, but usually has cooked meat and/or vegetables. Some robots on display at the 2009 Toy Fair were caught dancing to K-pop music. On this Korea page you will find some recent videos taken in Seoul. When people talk about social networking sites that South Koreans use, it usually includes Cyworld (Wikipedia page about Cyworld). The South Korean market is desired by the major sites, such as Facebook and MySpace. And there are many ways to look at the picture (scroll down for a slide show about asian social networking markets). And the reverse is happening, as Cyworld moves to other markets, including the USA. Perhaps the story is a mixed signal. The Korea Times recently wrote this article - Social Networking Is The Online Order Of The Day - after having written only months ago about Social Networking Sites Losing Energy. The second story was in May, during which a similar story appeared on SocialNetworkingWatch.com. Below is an interview of CyWorld.com's CEO (from 2006).